When the iPhone first debuted, all its apps could fit on a single Home screen. But it didn’t take long—especially once the App Store opened up shop—for even the most novice of iPhone users to require multiple screens. And once you started downloading new apps regularly, as many iPhone owners have done over the past couple years, you ended up with screen after screen after screen of apps to swipe through, with more than a few users exhausting the 180 visible slots. (Or, to put it another way, filling up 11 pages of 16 spaces, plus four in the dock). The result was a cry—OK, maybe it was just a gentle plea from most people, but it was a cry from us app-hoarders—for a better way to access and manage apps. Rob Griffiths put this wish into specific terms back in 2008, asking for Home-screen folders. With iOS 4, we get just such a feature, even if it’s been much slower in coming than some of us might have hoped. 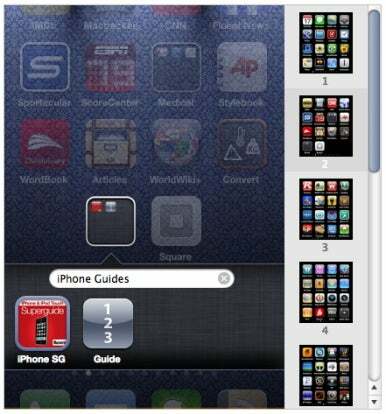 A folder in iOS 4 is a group of apps you access by tapping a single icon on your iPhone’s Home screen. When you tap a folder—which sports an icon that includes miniature versions of the icons of the apps inside, along with a name intended to describe the folder’s contents (more on that in a moment)—the dock fades and slides down, and the main Home-screen area fades and slides up to make room for a view of the folder’s contents. This view shows the name and full-size icon of each app. Tap on any app to launch it, or tap anywhere outside the folder area to close the folder and return to the Home screen. A new install—not an update—of iOS 4 includes a folder containing a few of Apple's apps. 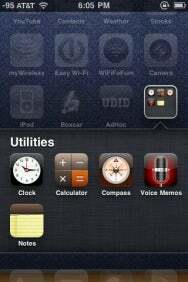 If you’re using an iPhone 4, or if you’ve restored an older iPhone or iPod touch to iOS 4, you’ll see a stock folder named Utilities that includes Apple’s Clock, Calculator, Compass, Voice Memos, and Notes apps. If you’ve updated an iPhone or iPod touch to iOS 4 from an older version of the iPhone OS, you won’t have any folders until you create one yourself. While iOS 4’s folder icons, which squeeze up to nine tiny app icons in the space of a standard-size icon, may seem less than useful at first, I found that, even on an iPhone 3G or 3GS, the mini icons are surprisingly identifiable, especially for apps with icons that are already familiar to me. I suspect this will be even more true on the iPhone 4’s higher-resolution display when that phone arrives later this week. I also like how Apple has handled status badges, those little white-on-red numbers attached to the corner of an app's icon that indicate, say, the number of unread messages in Mail or new articles in your RSS reader. If a folder contains one or more apps with a status badge, the folder gains a badge displaying the sum of those badges. In other words, if you've got 12 unread e-mail messages in Mail, 37 new articles in Reeder, and three new notifications in Boxcar, a folder containing those apps will sport a badge displaying 52. So how do you create a folder? First, enter iPhone’s standard Home-screen-editing mode by tapping and holding any app icon until app icons begin to shake and you see the delete (x) button in the upper-left corner of non-stock apps. Then drag one of the apps you want to include in your folder onto any other app you want to include. The Home screen will fade and you’ll see a folder display—still in editing mode—containing both apps. You’ll also see a folder-name field. This field is automatically filled based on the App Store category of one of the first two apps in the folder. If you’d rather use a different name, just tap in the name field (while still in edit mode) and then edit the name. When you’re done, press the Home button to exit edit mode. To add another app to the folder, enter editing mode again and then drag the desired app onto the folder icon. Repeat until you’ve added all the apps you want—up to 12, remember—and then press the Home button to finish editing. Note that if you drag an app onto a folder and hold it there for a couple seconds, the folder will open, still in edit mode, letting you place the new app exactly where you want it within the folder. To edit a folder itself—its name, its contents, or the layout of the apps inside—you can either enter editing mode normally and then tap the folder to edit it, or, if the folder is already open, just tap-and-hold any icon inside. You can then tap the folder name to edit it, drag app icons around within the folder to rearrange them, drag an app out of the folder (and onto the surrounding Home screen) to remove the app from the folder, or tap an app’s delete button to completely delete the app from the iPhone. Unlike apps, a folder doesn’t have a delete button. To delete a folder altogether, you must remove all the apps from it. Once you drag the last remaining app from a folder—or delete that app outright—the folder simply disappears. Overall, folders are easy to use, create, and edit and are a welcome addition to the iPhone. However, they do need some fine tuning that I expect will happen in future iOS 4 updates. For example, when trying to rearrange app icons on your Home screens, it’s too easy to accidentally create a new app folder, or to add an app to an existing folder, when all you really want to do is to position an app between two items. Although one benefit of folders is that promiscuous downloaders can now see more than 180 apps at a time, even casual app users can reap rewards from this new feature. For example, you can now group similar apps in ways other than screens—the more obsessive-compulsive among us no longer must agonize over which combination of 16 apps best fills a particular home screen. Instead, you can place, say, all your transit and transportation apps in one folder, your travel guides in another, and your food apps in a third—and use up only three spots on a Home screen in the process. And, of course, folders provide an alternative to one of the most requested—but still missing—iPhone features: the ability to delete the stock apps you never use. I don’t see Apple providing such a feature any time soon, but you can now stick all those unused stock apps into a folder and put that folder in the boondocks of your iPhone’s Home screens. The capability to create and edit folders isn’t limited to iOS 4 itself. Just as you’ve long been able to manage your installed apps when you sync with iTunes on your computer, the newly released iTunes 9.2 lets you organize your iOS 4 apps and folders using your mouse and keyboard. When your iPhone or iPod touch is connected to your computer, the Apps view in iTunes 9.2 looks and functions much as it did before, letting you choose which apps to sync to your iPhone, as well as decide how synced apps are organized on and between screens. But drag an app onto another app, and after a slight delay, a folder is created—just as if you’d performed the same action on the iPhone. You get the same editable folder name, and you can rearrange icons within the folder. The main difference is that, of course, you can use iTunes to manage folders only when your iPhone or iPod touch is connected to your computer. On the other hand, you don't need to click-hold to enter the jiggling-icon editing mode; you just click and drag at any time. Similarly, to edit an existing folder, you just double-click it. And my favorite advantage to performing this task in iTunes is that you can Command-click several apps and drag them onto another app or onto an existing folder all at once. You can also create and edit app folders in iTunes 9.2. Oddly, creating and editing folders in iTunes suffers from the opposite challenges of performing those tasks on an iPhone or iPod touch itself: Instead of too easily creating or adding to folders when you’re trying to simply rearrange apps on the screen, I find that iTunes’ Apps view too often moves app and folder icons out of the way when I’m trying to create or add to folders. Somewhere in between the sensitivity of on-iPhone and in-iTunes Home screen editing would be just about perfect. And I did experience one issue where, after creating a number of folders in iTunes, and then syncing my iPhone with iTunes, all the folders disappeared and my apps were rearranged (on the phone) in alphabetical order—an incident that required quite a bit of time and effort to recover from. Thankfully, this didn’t happen again. The capability to organize apps into folders is a great new feature that’s been a long time coming. It’s sure to be a favorite among those who, like me, have far too many apps. It doesn’t solve all the issues with managing your apps, especially within iTunes, but it's a big step up from swipe, swipe, swipe.